Nestled high amongst the ancient rainforest slopes of Thornton Peak you can relax away the day swinging in your hammock from your private balcony, cool off in the pool or unwind in the entertainment area. Our spacious chalets comfortably sleep 4 people. 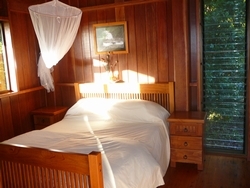 Coral Sea Views Luxury Chalets overlook majestic panoramas of the Coral Sea and the lush mountains and valleys of the Daintree Rainforest. The chalets are spacious and comfortable complimenting the tranquility and splendour of a tropical paradise where a myriad of Fauna, Flora and Marine life coexist. …explore the treasures of this abundant environment whether it be soaking up the rays on a remote sun drenched tropical beach, searching for the illusive Cassowary under the canopy of the pristine Daintree Rainforest, or jump on board on one of the numerous adventure activities. The trip from Cairns to Cow Bay is about 2 hours. Simply drive north from Cairns on the Cook Highway past Port Douglas. About 15 minutes drive past Port Douglas you will come to the small township of Mossman. Approximately a half hours drive past Mossman you come to a turn off to the right towards the Daintree Ferry. Keep an eye out for the signs. From this turnoff, about 4kms down the road, is the Daintree River where the ferry is waiting to take you deep into the rainforest. Once across the ferry, it’s a short 11km drive to Cow Bay. When you get to Cow Bay drive over Hutchinson Bridge, you should see a school on your right. Take the next road on the left, which is 2-3kms past the bridge, this is Mahogany Road. Look for the sign – “Coral Sea Views Chalets”. Things to do The Great Barrier Reef. Just 45 minutes off shore from Cape Tribulation is the World Heritage listed Great Barrier Reef. This is the only place in the world where two World Heritage areas exist side-by-side. These coral reefs are unchanged by human interference and shelter myriad of fishes, anemones, corals and sea-ferns! The Daintree Icecream Company: Discover the exotic tastes of the world famous Daintree Icecream Company. Made from local seasonal fruit like mango, coconut and wattle seed. Try the fantastic flavours and discover why Daintree Icecream Company is so popular with visitors. The Great Barrier Reef: Just 45 minutes off shore from Cape Tribulation is the World Heritage listed Great Barrier Reef. This is the only place in the world where two World Heritage areas exist side-by-side. These coral reefs are unchanged by human interference and shelter myriad of fishes, anemones, corals and sea-ferns. Beaches: Only 5 minutes drive from Coral Sea Views to beautiful white beaches.Picture perfect white sandy beaches fringe the tropical rain forest and just off shore are snorkellers and scuba divers can dive among the reefs.